These absolutely make my heart jump for joy! Please let these come to the game! These ones have me interested. I'll play the game my way and you play it your way! OMFG VENUS FLYTRAPS!!! Damn, I guess my year of whining and moaning about these finally paid off. And finally my garden of carnivorous plants can become complete! Now I'll just have to wait, what, 6 months or more for them to appear at the vendor. But hyped for them anyway! Yay for crimson antler corals as well, and even more yay for Dunmer statues! They're on my wish list as well. The New Life stuff sounds great, makes me excited for winter solstice this year, might even have to get that snowglobe home and decorate it with tons of pines, firs and ice sculptures and snowmen. 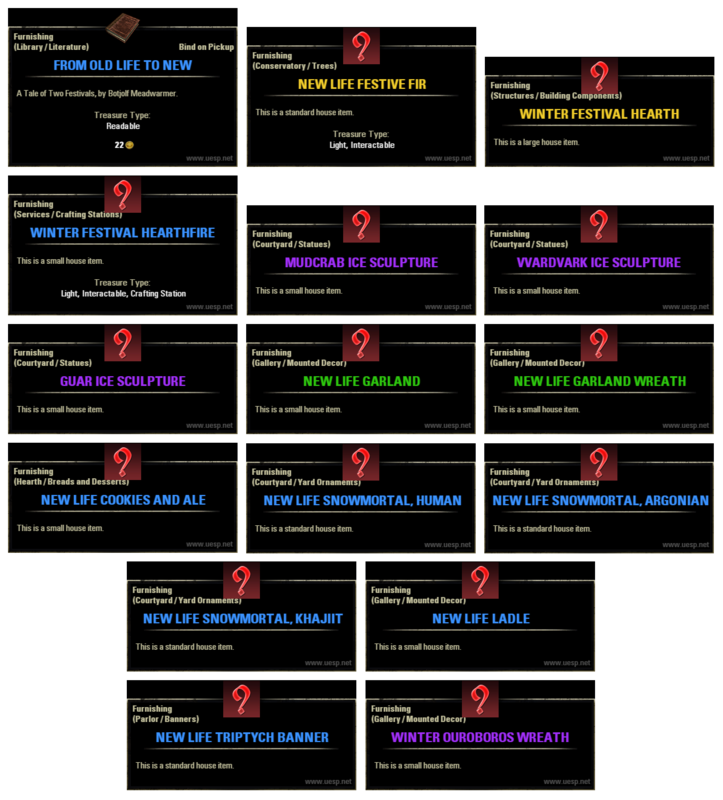 Dunno if anyone else noticed this, but Winter Festival Hearthfire is a crafting station...could it be the coveted provisioning station we can finally put in a fireplace? That would be a real New Life miracle. I just hope they didnt do something outrageous like make the fire red and green with sparkles. A plain pile of flaming logs will suffice, thank you. Oh well least they’re giving us the Jewelry sign at last. And the Black Door and it’s listed as a doorway furnishing... does this mean we’re getting placeable yet functional doors? Awesome, I was really looking forward to new structural components so that all of my creations don't look like worn ballroom flooring! lol and here i was waiting to post until the icons were all added! My suspicion is the Fish, Black Marsh is fished up. The Jel Parchment will be pickpocketed/stolen. 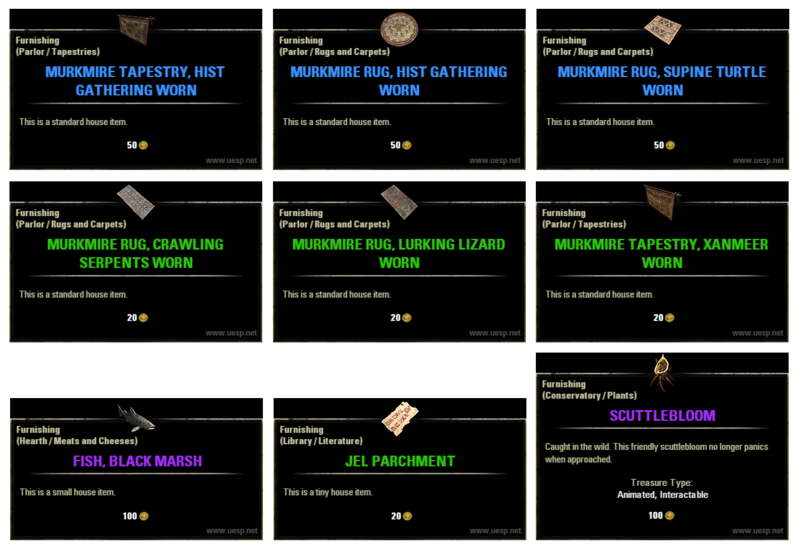 The worn carpets and tapestries may also be a stolen item (like the one carpet is from Wrothgar). The two gravestones I don't have a clue where those are coming from. @Carbonised thought of you when I saw that flytrap come up in the files! I am disappointed that the datamining seems to indicate that we aren't getting another luxury vendor with different themes and just getting those few new items added to Zanil. There are so many more items that could be added as luxury themes! edit: @Dacalana which addon are you using? I have been datamining in a rather tedious fashion of just linking the item ids and seeing if it corresponds to anything or not. Hah, linking id is a nice idea. Now you'll just have to wait until I get the garden area redone with lots of the new stuff we have gotten, and do another showcase of it here on the forums. These datamines are greatly appreciated though, it enables me to plan ahead according to what new stuff we get released, and which items I want for various homes. 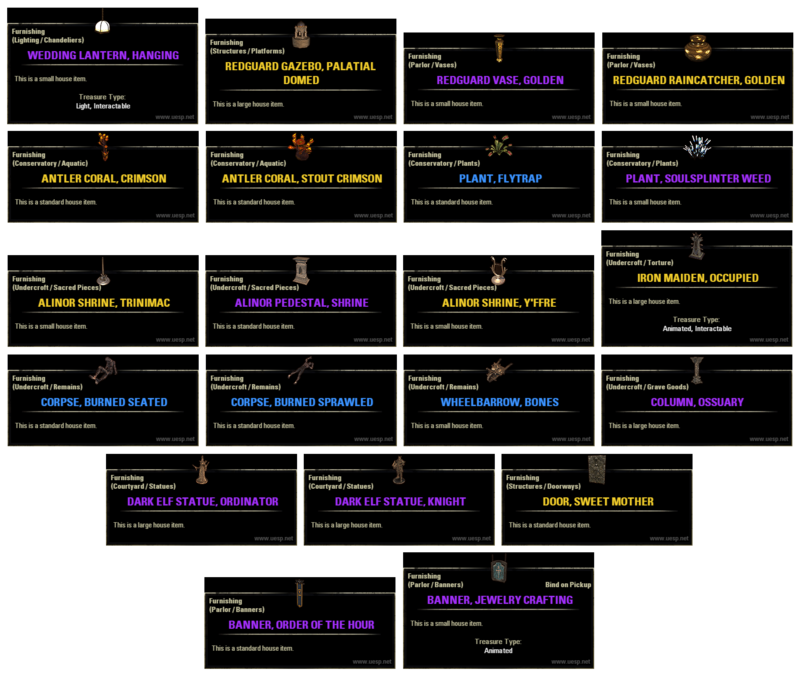 As well as giving me and others an overview of what's going to be added in the next half a year or so, so we can bug ZOS about all the other items they left out. 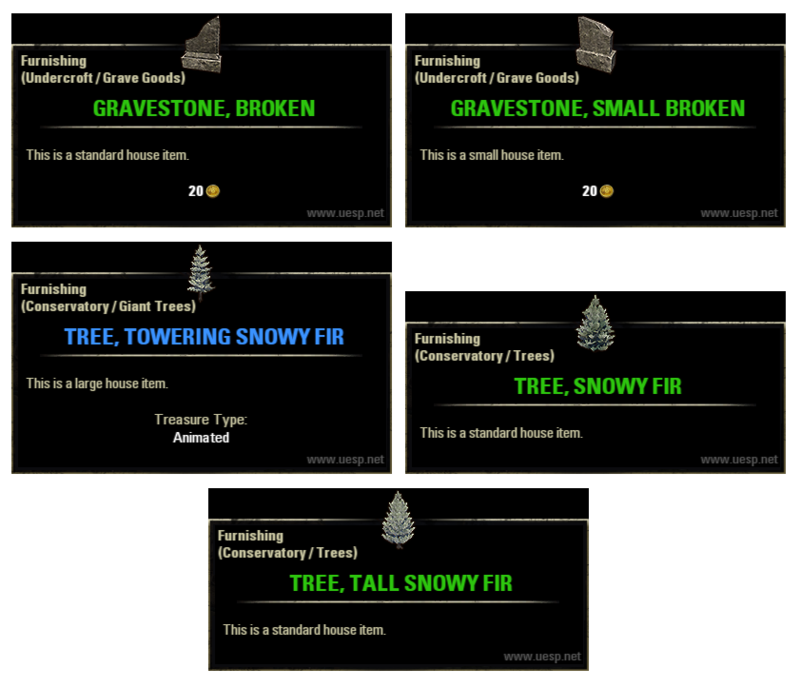 As immensely happy as I am about the Flytrap plants finally appearing, I'm also flabbergasted that we haven't gotten the Vvardenfell brass stove released as a furniture item after a year of people asking for it constantly. However, we do get an ugly mudbrick Murkmire oven that's craftable. Totally unsatisfied with that, btw. 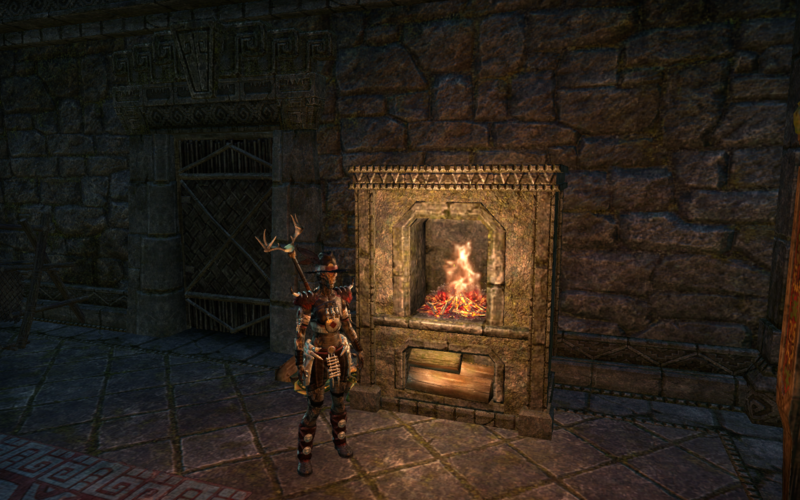 There're tons of fireplaces that are not in game, like go in Hew's Bane and count redguard ones we can't get for ourselves. So it's not a big suprise they didn't add it. I hope we will have more divercity for luxury vendor, maybe more items each week or less things we already had. I totally agree. It seems to be an utterly random decision to make certain items available while ignoring the constant requests from the community... total disconnect! 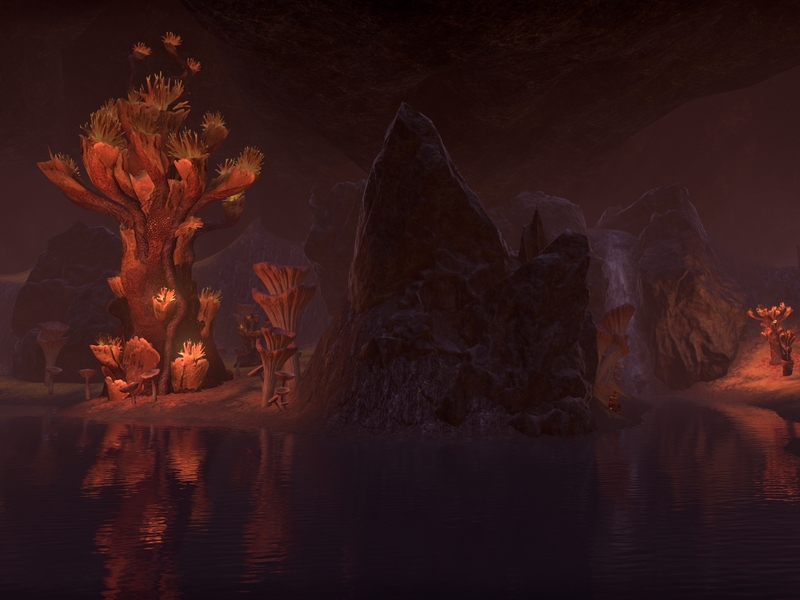 You mean the antler corals, the land corals are the Vvardenfell/Morrowind plants. 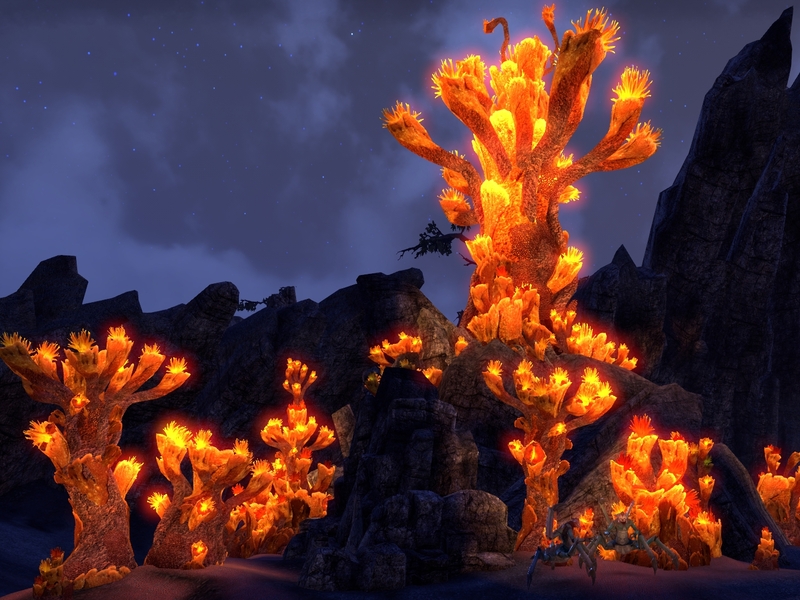 We do get 2 new antler corals it seems, called "crimson" this time, which brings the total of antler corals up to 4, which isn't bad if you want to recreate the Vivec's Antlers in your own seafront. Did the icons for the New Life stuff arrive yet btw? Curious to see some of them. It is yes. They seem to have an arbitrary limit of max 2 new items per weekend, which is silly. 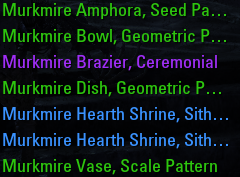 Hopefully we get the 3rd Dunmer statue later. Have you checked new updates on eso fashion? I see new recipes on the mastercrafter vendor, which is nice, but we need you to delve deeper into the PTs layers too !